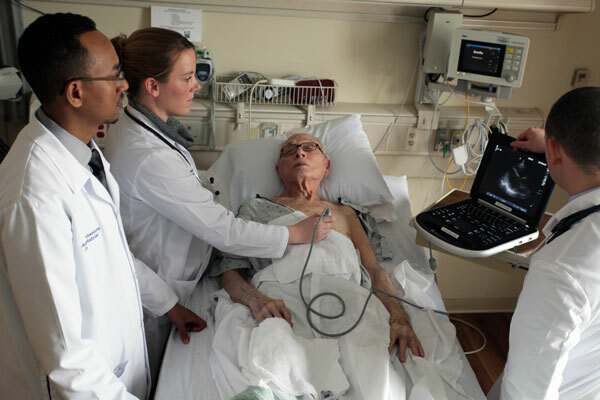 SONOSIM SUMMARY: This study aims to establish the degree of difference in how physicians interpret cardiac standstill on point-of-care ultrasound (POCUS). 127 physicians of varying specialties (emergency medicine, critical care, and cardiology) were prompted to determine whether or not 15 different looped video clips demonstrated cardiac standstill. The results of the survey demonstrated that the clips generated significant disagreement amongst physicians when displaying valve flutter, mechanical ventilation, weak myocardial contraction, or profound bradycardia. The study concludes that POCUS would benefit from a more precise and explicit definitions of cardiac activity and standstill. Hu K, Gupta N, Teran F, et al. Variability in interpretation of cardiac standstill among physician sonographers. Ann Emerg Med. 2018 Feb;71(2):193-198. Cardiac standstill on point-of-care ultrasonography has been widely studied as a marker of prognosis in cardiac arrest. Return of spontaneous circulation has been reported in as few as 0% and as many as 45% of patients with cardiac standstill. When explicitly documented, the definition of cardiac activity in these studies varied from any slight change in echogenicity of the myocardium to any kinetic cardiac activity. We hypothesize that the variability in research definitions of cardiac activity may affect interpretation of video clips of patients in cardiac arrest. The goal of this study is to assess the variability in interpretation of standstill among physician sonographers. We surveyed physician sonographers at 6 conferences held at 3 academic medical centers in the Greater New York area. Survey respondents were allotted 20 seconds per slide to determine whether each of 15 video clips of patients in cardiac arrest were standstill or not. Data were collected anonymously with radio frequency remotes. There were 127 total participants, including faculty, fellows, and resident physicians specializing in emergency medicine, critical care, and cardiology. There was only moderate interrater agreement among all participants (α=0.47). This lack of agreement persisted across specialties, self-reported training levels, and self-reported ultrasonographic expertise. According to the results of our study, there appears to be considerable variability in interpretation of cardiac standstill among physician sonographers. Consensus definitions of cardiac activity and standstill would improve the quality of cardiac arrest ultrasonographic research and standardize the use of this technology at the bedside.